Bristow described the gold industry, which is under-performing the gold price, as being trapped in a narrow range. Against that backdrop, Randgold’s next growth possibility could well be further afield than within the gold belts of Africa, where its focus has been up to now. 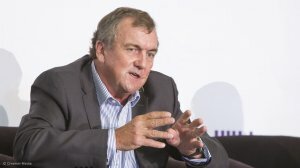 Asset quality overrides jurisdiction is the oft-stated Bristow view, and with Randgold now big enough and sufficiently confident in its operating systems, he believes it could comfortably manage six to seven different operations. “We have the balance sheet, we have the expertise and, what’s more important, we have the model of our mines being run by on-site, on-mine executive management,” Bristow outlined to Mining Weekly Online. The abundance of single-asset gold-mining companies being developed across the globe, particularly in the Americas, is presenting merger-and-acquisition (M&A) opportunities. The assessment of tier-one-level assets across many jurisdictions is seen as appropriate at this crucial phase of gold industry cyclicality. CFO Graham Shuttleworth reported year-end net cash of $500-million to fund new growth opportunities and cash and cash equivalents of the debt-free company have since grown to $739.5-million. In the active first quarter, the Ntiola satellite deposit at Morila in Mali – the company’s starting point in the mid-1990s – was prepared for mining, Kibali was ramped up, the Gounkoto super pit project in Mali was advanced, the Baboto satellite pit at Loulo, also in Mali, was developed, a difficult labour situation at Tongon was settled and robust mining code negotiations ensued with the DRC government. “This demonstrates the depth and competence of our management team, and its ability to deal with complex operational and socio-political issues on multiple fronts,” said Bristow. First-quarter profit was $66.5-million, gold production totalled 286 890 oz of gold and the cash cost per ounce was $720. The company expects to remain profitable at a long term gold price of $1 000/oz and generating cash that will support growth and continued dividend payment.